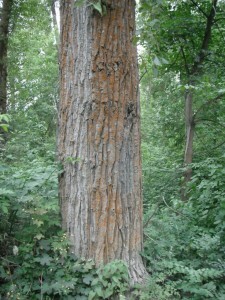 Names: Black Cottonwood is also known as Balsam Poplar. Balsamifera means balsam (aromatic resin)-bearing. 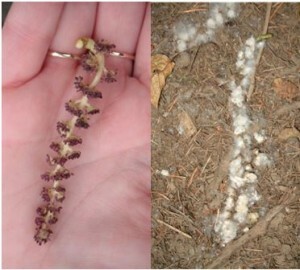 Trichocarpa means with hairy fruits, referring to its fluffy seeds. The cottony seeds are often seen drifting in a summer breeze, giving the tree its common name of Cottonwood. Relationships: There are about 15 species of Populus (Poplars, Cottonwoods and Aspens) native to North America. In our region, Black Cottonwood is very common. Also found sporadically in our region is the Quaking Aspen, (Populus tremuloides). 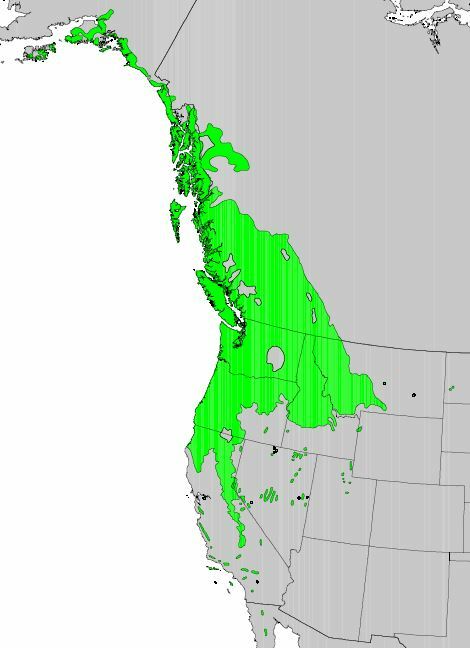 Distribution: Black Cottonwood is found from coastal Alaska to the mountains of California, with some growing as far south as northwest Mexico. It reaches from the Pacific Ocean to the Rocky Mountains. 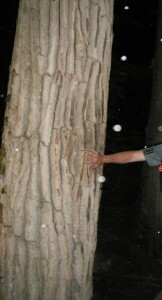 Growth: Black Cottonwood grows very fast, several feet each year. It can grow to 150’ (50m) or more and can live 200-300 years. Habitat: It usually grows on wet to moist sites in floodplains and along rivers. Wetland designation: FAC, Facultative, it is equally likely to occur in wetlands or non-wetlands. 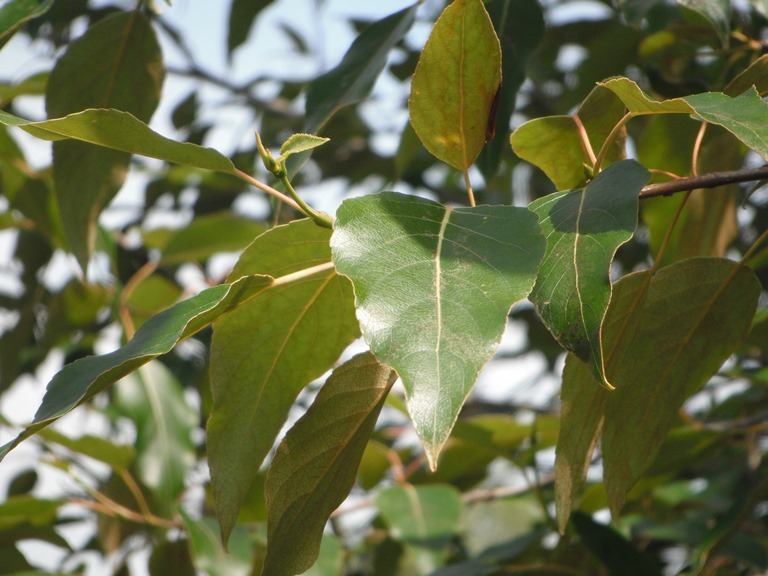 Diagnostic Characters: The thick, heart-shaped or triangular leaves of Black Cottonwood grow from 2 to 6 inches (5-15m) long, sometimes larger. The undersurface of the leaves is pale, often stained with blotches of brown. Buds are sticky with resin and are fragrant. Catkins appear before the leaves in the spring. The fruits are hairy, rounded, 3-part capsules that split to release numerous cottony seeds that float through the air. Old bark is dark gray and deeply furrowed. 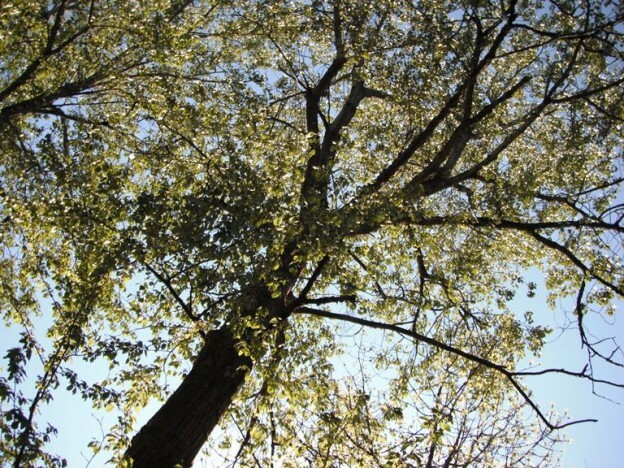 In the Landscape: Black Cottonwood is not a good choice for most gardens. It becomes very large very fast and is also very messy. It, however, is very good wildlife habitat and is very valuable for quick restoration along floodplains and other moist areas. 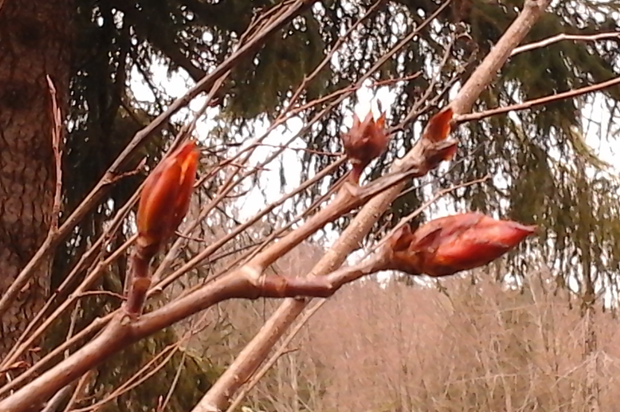 Phenology: Bloom Period: Early March to June, with male and female catkins on separate trees. 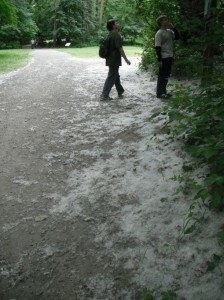 Cottonwood pollen is another major allergen. Seeds ripen late May to July. Seeds may be dispersed by wind or water. Flowering catkin and fallen seedhead. Propagation is similar to that of willows. It is easily propagated by cuttings; and fresh seeds germinate easily. 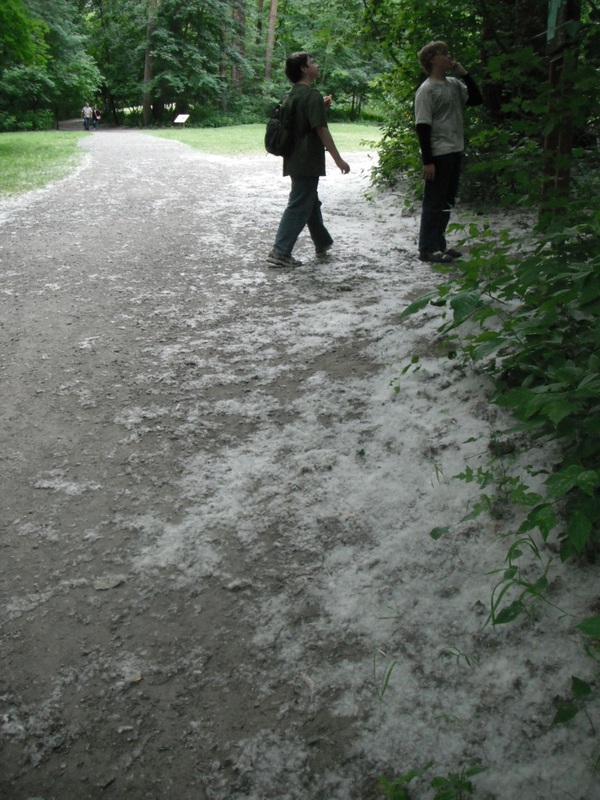 The numerous fluffy seeds of Black Cottonwood resemble snowfall in summer. 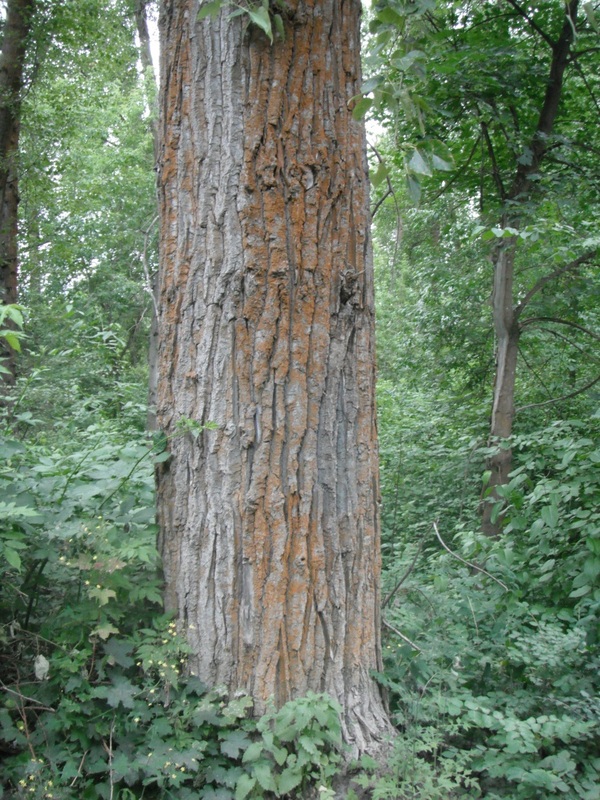 Use by People: Natives used Black Cottonwood for many medicinal purposes. They used the gum of the burls on cuts and wounds. Bruised leaves were also placed on cuts as an antiseptic. 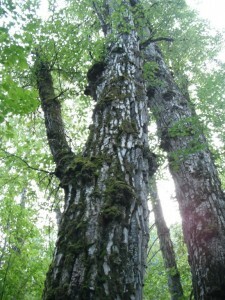 An infusion of the bark was used for sore throats. Young shoots were used to make sweat lodges. Today Black Cottonwood is used for the interior layers of plywood and for paper products, especially high-grade book and magazine paper. It is a parent of fast-growing hybrid poplars such as P. trichocarpa x p. deltoides, which are being grown specifically for paper products and biofuels. Use by wildlife: Streamside Black Cottonwoods create favorable fish habitat by providing stream bank stability, increasing nutrient availability by the shedding of leaves and twigs, and creating a shaded microclimate. Black Cottonwood is also a favorite nesting or perching tree for many bird species (Bald Eagle, owls, ospreys, hawks, hummingbirds, woodpeckers, etc.). Deer and elk use it more for cover than for forage. Rabbits and hares eat the bark. Beavers find it most palatable and use it for dam building. This entry was posted in Broadleaved Trees on October 13, 2014 by habitatdana. Like my Facebook Page to receive updates on new posts! Author: Dana Kelley Bressette, M.S. *All photographs on this site were taken by Dana, Edmund or Sky Bressette unless otherwise noted. **Use of articles and photos on this site is permitted for educational purposes only.